Rio de Janeiro is, hands down, my favorite city in the world. It has amazing weather, incredible beaches, mountains, and rainforests, a rich culture (especially in music and dance), miles of oceanfront running trails, and plenty of activities for adventurers. I’m lucky that it’ll be my 5th visit to the city this upcoming February. I can hardly wait and almost want to press fast forward to get there sooner! If you haven’t been yet, trust me: it’s bound to be the trip of a lifetime. Whether you’re a sun-worshipper or a fun-worshipper, Rio has something for you. Make sure to drink in the culture (and some caipirinhas, which I’ll get to in a moment) along with the beautiful scenery. And, at least once, make sure to kick up your heels, throw your rhythm-less caution to the wind and samba like nobody’s watching. 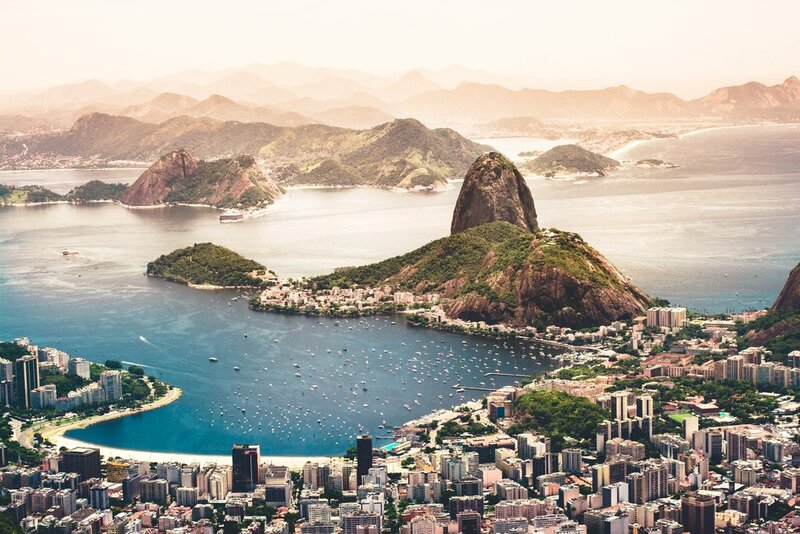 Here is your guide to Rio de Janeiro for the best sun, beaches, caipirinhas, and samba… and much more. Let’s start with the beaches. Thanks to song lyrics and pop culture, most people think of Copacabana beach when they think of Rio. But Ipanema Beach is the most popular beach (and is also mentioned in a song), followed closely by Arpoador and Leblon, all of which have cleaner water and sand than Copacabana. Ipanema is considered the smaller, quieter, and less crowded little sister of Copacabana, located in a more upscale area. You can grab a coconut or a chair from one of the street vendors or go to the nearby park. Be warned, though, the water at Ipanema can be a little rough, so be careful. The waves may get up to 5 or 6 feet on some days, so use common sense and stay near the lifeguard towers if you’re a cautious swimmer. Arpoador is in the middle of Copacabana and Ipanema and is considered the birthplace of surfing, so you will see lots of swimmers, surfers, and bodyboarders here. It’s a smaller beach favored by the locals. It’s also the most famous spot for watching the Rio sunset. Bring some good shoes, though. In order to get to those views, you need to climb up a rocky trail, and flip-flops won’t cut it. Leblon is another gorgeous beach. The waves here are smaller, so there are fewer surfers and more swimmers. It’s a little quieter, but still offers plenty of shops and restaurants, and of course, those gorgeous views. You can easily rent a bicycle and ride to Copacabana and back from any of these beaches. There is a coastal trail for biking, running, and walking that spans from the edge of Lebon to the edge of Copacabana. There are also outdoor gym sets along the trail, and you will see many local cariocas getting their daily workout while taking in the incredible views. I’ve never been quite as motivated to get up for my daily morning run as when I was in Rio, and I could look forward to a long and satisfying run along the beach with paved trails! It surely helped me burn off some of those caipirinhas. Speaking of caipirinhas, they’re the signature drink of Brazil, traditionally made from cachaça (a distilled spirit made from fermented sugar cane juice), sugar, and lime. Some places add exotic Brazilian fruits like kiwi, cupuaçu, jabuticaba, umbee, and lychee to their caipirinhas. Others replace the cachaça with vodka, sake, or rum. One of the best known and most loved places to get authentic caipirinhas, as well the spot credited for putting caipirinhas on the map, is the Academia da Cachaça in Leblon. If you’re a night owl and you find yourself at Ipanema, check out Barzin. It has a restaurant/bar, a lounge, a beautiful terrace, and best yet, they’re open late. And, since both Ipanema and Leblon have spectacular beaches, you can kill two birds with one stone at either place. While you’re in Rio, you have to sample local music and dance offerings. Listen to some pagode, a form of music that spun off from samba right here in Rio de Janeiro. It is more down to earth, with just a few instrumentalists and a singer. Here is a youtube video of a famous pagode song. Of course, the other two types of music to listen to are samba and bossa nova. Whether you’re a samba newbie or you can shake it with the best of the them and you’re in Rio on a Monday, try out samba at Pedra do Sal (at Morro da Conceição). It’s an outdoor street party where tourists and locals alike samba up and down the Pedra. If you really want to party like a samba Rockstar, check out Rio Scenarium, which is the top club in Rio and considered to be one of the top clubs in the world. There’s no techno here, just three stories of live musicians, plenty of samba, and even a restaurant. Another place to check out is the area of Lapa, especially on Friday nights. It will be filled with street food vendors, musicians playing in the street, bumping nightclubs, and a variety of opportunities to meet and talk with locals. Try the club Café Cultural Sacrilégio (also just known as Sacrilégio) while you’re there. This is a venue that brings local and international talent. You’ll be able to hear samba, pagode, and bossa nova here on different nights. One of the must-sees in Rio is the view from the Rio De Janeiro statue, Christ the Redeemer (pictured below). It’s an art deco statue at the peak of Mount Corcovado in the Tijuca Forest National Park. The statue stands 98 feet tall and 92 feet wide and is considered one of the new 7 wonders of the world. Standing there, you can see a panoramic view of Rio, including Sugarloaf Mountain (Pão de Açúcar), which juts into the Atlantic Ocean out of Guanabara Bay. There are two ways to the summit: the Corcovado train or a minibus. The minibus also stops at the Corcovado helipad on the way and lets you get another, different view of the statue. Pão de Açúcar (Sugarloaf Mountain) is another attraction not to miss. You can take a cable car to the top of this mountain to get spectacular city views. Take a hike around the top of the mountain and you’re sure to encounter a few monkeys as well. If it’s action and adventure that you seek, when you’re finished seeing Christ the Redeemer, look no further than Pedra Bonita. It’s one of the most popular hikes in Rio and mandatory for any adventurer, because once at the top, the views are great. The hike itself isn’t too challenging but can be steep in a few places. You don’t have to be a fitness nut; just take your time and you’ll be fine. For those of you who need a little more adrenaline in your adventure, Pedra Bonita is also the location of Rio’s paragliding and hanggliding ramp, where tourists can glide with an instructor to the beach below. If you’re not brave enough to be a glider, you can stand there enjoying the terrors and triumphs of others, while taking in the view. Açaí has become a health craze around the world, so you’re probably familiar with it. However, if you have never had the real thing in Brazil, you haven’t had it at all! The flavor is completely different and much more complex and delicious than anything you will have outside of the country. So get yourself to a juice bar, stat! The carnival in Rio de Janeiro is the largest street festival in the world, held yearly during the first five days of Catholic Lent. I’ve been to street festivals all over the world, but nothing comes close to Carnival. During the day, there are samba-packed neighborhood block parties called “blocos.” There’s live music and drummers. and anyone is welcome to dance the day away. At night, head over to the Sambodromo da Marques Sapucai (Sambadrome for short) for a parade like no other. The more than 200 local samba schools compete for the title of best costumes, dancing, and parade floats. Basically, think of the best street festival/parade you’ve ever been to, turn up the volume to 10, and you might come close to the experience of Carnival. Even though it’s a huge party, there really is something for everyone. You will see people from all walks of life partying together and having a blast. Tourists are always welcome to join in. Be advised that if you want to get into the Sambadrome during Carnival, you need to buy your tickets well ahead of your visit. If you are planning on coming just for Carnival, try to arrive at least a day in advance. While it’s not in full swing on day one, getting a cab from the airport won’t be fun and when you do manage to score one, you’re going to sit in a ton of traffic. So, if you can, get there early, familiarize yourself with your surroundings, and enjoy a caipirinha or two while you figure out what you want to do first. “Favela” is the Portuguese word for slum. These neighborhoods are usually on the edge of town, and they’re a type of “shanty town,” where the homes are made from all kinds of materials, salvaged from the streets. While some favelas are high-crime areas, not all favelas are overrun by gangs, and instead are vibrant with street food, art, music, and culture. Rocinha is the largest favela in Brazil, and there are several tour companies that offer favela tours. Don’t try to do a self-guided tour. Pay the money and book with a reputable tour company. Keep in mind that a good tour usually includes a visit to a school and an opportunity to leave a positive mark on the community. A great luxury beachside hotel in Rio de Janeiro is the Marina All Suites. It has a drop dead gorgeous view of Leblon and Ipanema beaches from its rooftop pool and seaview suites. A more budget option is the Mango Tree Hostel, which I’ve also stayed at several times. It's clean and quaint, a block from the ocean, and has a great jungly vibe with all of the swinging hammocks and lush greenery. The Miramar Hotel by Windsor and the Belmond Copacabana Palace, and the Hilton Barra Rio de Janeiro should also make the top of the list, because I’ve heard great things about them from people who have stayed. They each offer free internet/Wi-Fi, free parking, air conditioning, and a pool. The Miramar and the Belmond are both beachfront properties. The Hilton is a little further from the action but is next door to a great mall and is close to the Olympic Park. If you’re on more of a budget, try the Vogue Fashion Hotel by Lenny Niemeyer. It offers the same amenities as the five-star hotels, as well as free transportation to the beach and it’s near two popular shopping areas. If you want luxury, gorgeous views, and a quaint experience that is a little more secluded, the Vila Santa Teresa, a private mansion that overlooks Rio, won’t disappoint. It’s a 5-star luxury boutique hotel that has seven suites, each with free Wi-Fi, free parking, air conditioning, a pool, and free breakfast. Rio is in a tropical climate, so it stays warm and sunny year-round, with December and January as the warmest summer months. Winter starts in June and ends in August. If you’re a Carnival fan, February to March is when you want to book your trip. Be sure to pack a poncho or something to keep you dry. Carnival is notorious for having some rainy days. 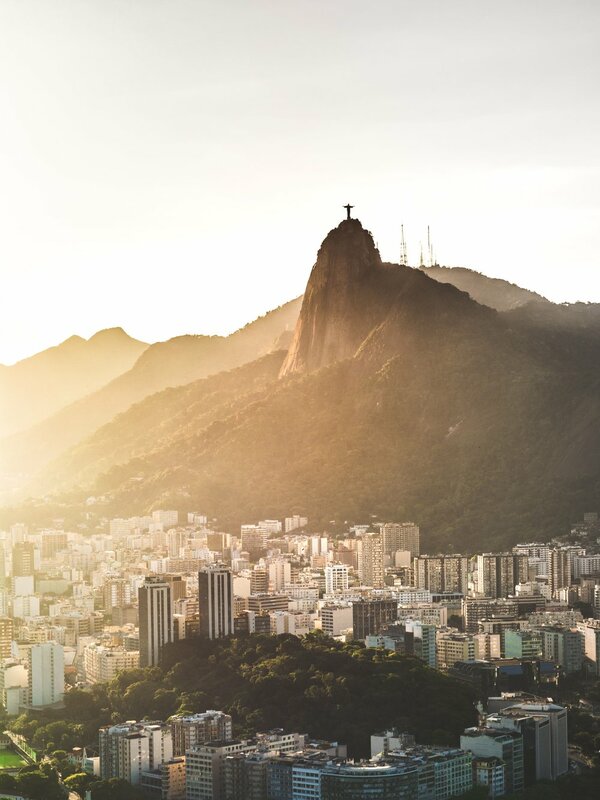 No matter when you go, Rio has a rhythm and a beat all its own, and some spectacular views to boot. Rio de Janeiro observes Brasilia Time (BRT) in the winter and Brasilia Summer Time (BRST), a Daylight-Saving Time time zone, in the summer. During winter (BRT), the UTC offset is UTC-2 and UTC-3 during summer (BRST) For an example, if you live on the East Coast of the United States, Rio is 2 hours ahead during BRT and 3 hours ahead during BRST. Translation: the jet lag is no worse than if you flew across the USA. Hopefully this gives you enough to get started on your exploration of this amazing city. There is so much to do in this city that I keep finding incredible new spots every time I come back.